With Dual Action also along with LCD Window showing Time, Speed, Distance, Calories & Hand pulse. Excellent for Home Use. 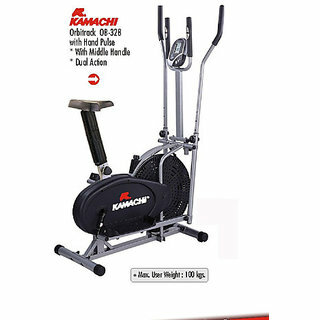 Kamachi OB-328 Elliptical Bike With Dual Action also along with LCD Window showing Time, Speed, Distance, Calories & Hand pulse. Excellent for Home Use. Meter showing Time, Distance, Speed, Calories & Hand pulse. To Recieve updates and possible rewards for Kamachi OB-328 please sign in. To Recieve updates and possible rewards for Cross Trainer/Elliptical please sign in.